Venezuela's US-backed opposition shrewdly chose not to participate, recognizing that refusing to do so would be far more rewarding than running a slate of candidates that might lose to “Chavistas” or Maduro loyalists. 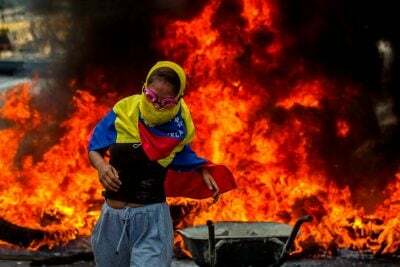 The opposition in Venezuela, which is backed by the United States and supported by prominent “human rights groups”, like Amnesty International and Human Rights Watch, has played a key role in fomenting violence that has resulted in multiple deaths. However, most world leaders and press around the globe pin all responsibility on Venezuela President Nicolas Maduro’s government. In the United States, it is exceptionally difficult to find news reports that document the violence of the opposition, along with the violence of the government. The fact that the vast majority of daily news reports do not detail the actions of the “guarimbas,”—the opposition blocking roads, setting fire to tires and other objects, and throwing objects—demonstrates how skewed media coverage of Venezuela is currently. A Venezuelan soldier was killed in the western state of Tachira. A bomb was set off in Caracas nearby police officers on motorcycles. It injured multiple officers. Reuters journalist Girish Gupta in Caracas reported the streets were closed. Trash was burning on most of the streets and kids were out “in balaclavas with slingshots,” which has become normal. “We have – and this is something that’s surprised even me today, and actually very close to where I am based here in Caracas, we saw a bomb go off. It was targeted towards police officers. And it wasn’t huge. It didn’t kill anybody. But it’s not something – we don’t see that sort of insurgent-type equipment being used. So that’s interesting. And that might be an escalation we’re seeing from the opposition or some parts of it,” Gupta said. Amnesty International and Human Rights Watch take a simplistic and disingenuous view of the intensifying crisis in Venezuela, ignoring the acts of a violent insurgency entirely. “Venezuela is at a turning point, as are its regional neighbors. Latin America should show the world it will not tolerate a full-fledged dictatorship that is willing and able to commit widespread abuses against its people while unraveling the fundamental democratic principles that the region worked has hard to build,” Human Rights Watch declared after the constituent assembly vote. Ironically, the constituent assembly vote was held to address the urgent needs of the population. Maduro wanted the opposition’s participation to end the brewing conflict. The opposition shrewdly chose not to participate, recognizing that refusing to participate would be far more rewarding than running a slate of candidates that might lose to “Chavistas” or Maduro loyalists. The opposition blasted the vote as one-sided and even held their own referendum against the constituent assembly vote that involved Venezuelans from all over the world. They were easily able to achieve the propaganda coup of further cementing perceptions that Maduro is a strongman, who must step down from power. “By sanctioning Maduro, the United States makes clear our opposition to the policies of his regime and our support for the people of Venezuela who seek to return their country to a full and prosperous democracy,” Mnuchin added. Yet, what few are willing to concede is that calling the constituent assembly vote may have been a poorly conceived decision by Maduro, but it was most certainly within the government’s power. There also is a bit of protection from undue influence in that it prevents Maduro from objecting to whatever new constitution is passed by the assembly. Existing authorities are not allowed to obstruct the process in any way. Smartmatic, the company which has helped manage Venezuela’s voting system since 2004, accused the Maduro government of manipulating the results of the constituent assembly vote. But the company has provided scant specifics on how they know this for certain. They even said they did not pass evidence of alleged manipulation or tampering of the vote count to Venezuela’s electoral council, which seems puzzling. “The technological solution developed by Smartmatic, which has been used in Venezuela since 2004, includes touch-screen voting machines that store votes electronically (encrypted and scrambled), and print a paper receipt for each vote. This characteristic, the full implementation of the VVPAT concept, gives the system a great advantage,” Carter asserted. Smartmatic could call on the Venezuelan government to conduct an audit or verification of results. Notably, that wasn’t in their statements to press. All they did was fan the flames of outrage against a left-wing government that carried out a process allowed by the country’s constitution. What may have happened if the opposition, mostly composed of right-wing elements, had run a slate of candidates who pledged to resolve a deepening economic crisis? More than likely the opposition would have sustained massive defeats at the polls. The country overwhelming believes the opposition lacks a plan for dealing with high inflation and the lack of state revenue for social services. They also oppose the violent tactics of the opposition. The opposition is much better off engaging in violent protests that force responses by the government and make the Maduro government look like an authoritarian regime. They won the support of the European Union, Canada, as well as Argentina, Brazil, Colombia, and Mexico, which condemned the constituent assembly vote. The Trump administration has turned to sanctions and other initiatives to force regime change, and there is no telling what the CIA might be doing to bolster the efforts of opposition activists. Regime change is only possible if the opposition is able to implant its propaganda into the world’s conscience. Adrian Kane, chair of the Irish Congress of Trade Unions Energy and Natural Resources Committee, was invited by Venezuela’s electoral council to observe the constituent assembly vote. Make the world believe the government is violent and there is no way to really figure out what violence the opposition is responsible for and any insurgency can engage in the armed overthrow of their government with global support. That does not mean they will be able to successfully govern a country.